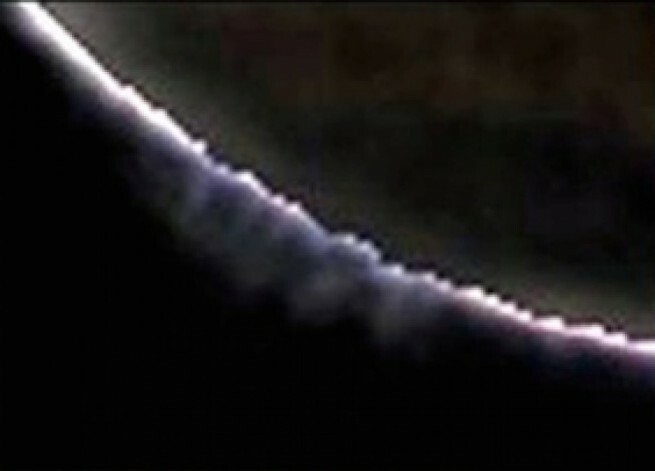 In March 2012, amateur astronomers began observing unusual clouds or plumes along the western limb of the red planet Mars. The plumes, in the southern hemisphere rose to over 124 miles (200 kilometers) in altitude persisting for several days and then reappeared weeks later. A group of astronomers from Spain, the Netherlands, France, UK and USA have now reported their analysis of the phenomena. Their conclusions are inconclusive but they present two possible explanations. The phenomena occurred over the Terra Cimmeria region centered at 45 degree south latitude. 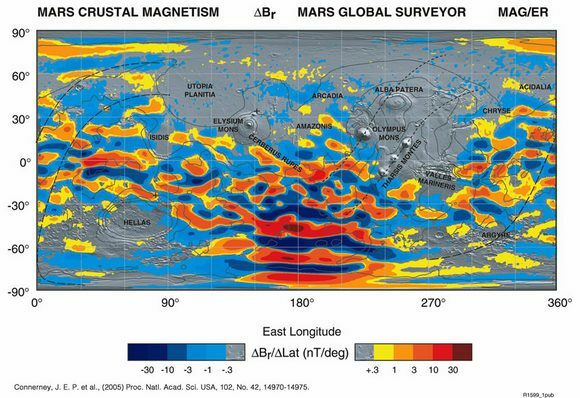 This area includes the tiger stripe array of magnetic fields emanating from concentrations of ferrous (iron) ore deposits on Mars; discovered by the Mars Global Surveyor magnetometer during low altitude aerobraking maneuvers at the beginning of the mission in 1998. Auroral events have been observed over this area from the interaction of the Martian magnetic field with streams of energetic particles streaming from the Sun. Sánchez-Lavega states that if these plumes are auroras, they would have to be over 1000 times brighter than those observed over the Earth. The researchers also state that another problem with this scenario is the altitude. Auroras over Mars in this region have been observed up to 80 miles (130 km), only half the height of the features. In the Earth’s field, aurora are confined to ionospheric altitudes – 60 miles (100 km). The Martian atmosphere at 124 miles (200 km) is exceedingly tenuous and the production of persistent and very bright aurora at such an altitude seems highly improbable. The second explanation assessed by the astronomers is dust or ice crystals lofted to this high altitude. Again the altitude is the big issue. Martian dust storms will routinely lift dust to 37 miles (60 km), still only one-third the height of the plumes. Martian dust devils will lift particles to 12 miles (20 km). However, it is this second explanation involving ice crystals – carbon dioxide and water – that the researchers give the most credence. In either instance, the particles must be concentrated and their reflectivity must account for the total brightness of the plumes. Ice crystals would be more easily transported to these heights, and also would be most highly reflective. Still too many questions remain and the researchers state that “both explanations defy our present understanding of the Mars’ upper atmosphere.” By March 20th and 21st, the researchers summarized that at least 18 amateur astronomers observed the plume using from 8 to 16 inch diameter (20 to 40 cm) telescopes at wavelengths from blue to red. 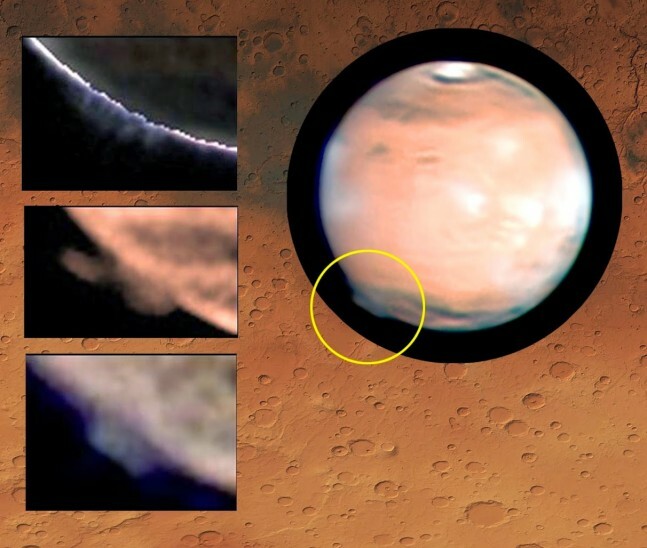 At Mars, the Mars Color Imager on MRO (MARCI) could not detect the event due to the 2 hour periodic scans that are compiled to make global images. Of the many ground observations, the researchers utilized two sets from the venerable astrophotographers Don Parker and Daiman Peach. While observations and measurements were limited, the researchers analysis was exhaustive and included modeling assuming CO2, water and dust particles. The researchers did find a Hubble observation from 1997 that compared favorably with the 2012 events and likewise modeled that event for comparison. However, Hubble results provided a single observation and the height estimate could not be narrowly constrained. Greetings: The cause of this mystery dust plume is related to Sun-Earth-Black Star magnetic portal connection convergence, portal-to-portal cross firing and the generation of highly-charged ionic clouds pushed towards the Sun between the converging portal connections. This is a link to the reconstructed ISWA-imaging data showing Earth magnetosphere turning around for the bow shock to face the Leo Constellation on the same day! My research team has been tracking the gravitational-magnetic anomaly through the Leo Constellation (2010-2012), Virgo (2012-2015) and now into the Libra Constellation since January 2011. We predicted the Fukushima Quake (March 11, 2011) to within four days and the Guerrero Quake the following year within just two days (March 20, 2012), which was eight days after Earth magnetosphere turned around for 28 hours and this mystery dust plume appeared in the southern hemisphere on the dark side of the red planet. Therefore, our team of astronomers and physicists are not alone in knowing full well what caused the mystery dust plume anomaly on Mars on March 12, 2012, which is perhaps the most important series of events pointing to the absolute fact that we have a gravitational-magnetic anomaly already moving in the inner solar system that is likely the invisible-collapsed-remnant remains of our Sun’s once much-larger binary twin. I am happy to share more information on my Project Black Star Investigation if anyone is interested. Here is a complimentary link to my recent newsletter. Get more information, subscribe to the newsletter-survival group programs at https://www.terral03.com, again, if interested.